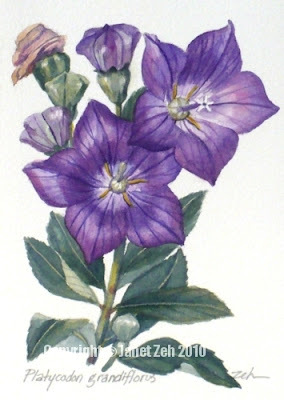 Balloon flowers get their name from the flower buds. The delightful buds resemble hot air balloons just before opening. My balloon flowers are still in bloom and I picked a stem to bring inside for this painting. You can see the flower in different stages from a new green bud, to buds that have "ballooned" to the opened flowers and even a spent flower that is ready to seed.